A sweet savory mustard sauce with a jalapeno kick. Founded in 2013 made in the United States of America. 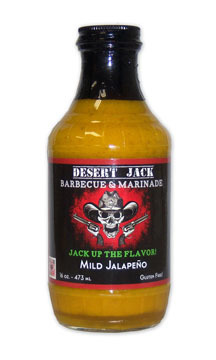 Desert Jack sauces are so versatile, they are not merely a barbecue sauces. They tastes great on chicken, fish and shrimp.They work great as a dipping sauce for raw veggies and French fries too.